Visit Beach Mansikkalahti and Aurinkolahti Beach for some beach relaxation. Step off the beaten path and head to Seurasaari Island and Open-Air Museum and Linden Esplanade. Explore Helsinki's surroundings by going to Kotka (St. Nicholas Orthodox Church, Kotka Church, & more), Porvoo (Cathedral of Porvoo & Porvoo Old Town) and Lahti (Apulandia & Motorcycle Museum of Finland). There's still lots to do: admire the masterpieces at Kansallisgalleria, stroll the grounds of Hietaniemi Cemetery, take an in-depth tour of Museum of Worker Housing (Tyovaenasuntomuseo), and hunt for treasures at Hakaniemi Market. To see where to stay, other places to visit, ratings, and more tourist information, read our Helsinki road trip site . If you are flying in from Switzerland, the closest major airport is Helsinki Vantaa Airport. In April, plan for daily highs up to 9°C, and evening lows to 0°C. Finish your sightseeing early on the 20th (Sat) so you can drive to Espoo. Espoo is the second largest city and municipality in Finland. 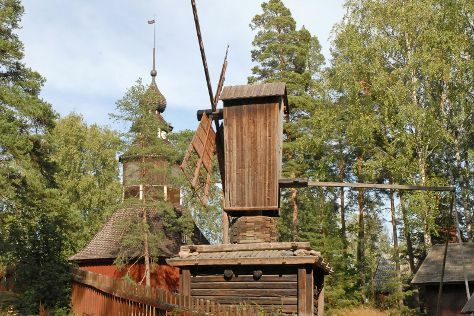 Start off your visit on the 21st (Sun): don't miss a visit to Ekenas Old Town, examine the collection at Ekenas Museum, and then pause for some serene contemplation at Lohjan Pyhan Laurin Kirkko the Church of St Lawrence Lohja. Here are some ideas for day two: examine the collection at Fagervik Museum, take in the architecture and atmosphere at Pyhan Katarinan kirkko, and then enjoy the sand and surf at Bellevue Beach. To see more things to do, traveler tips, reviews, and more tourist information, read our Espoo holiday planner. Espoo is just a short distance from Helsinki. In April, daily temperatures in Espoo can reach 9°C, while at night they dip to 0°C. Wrap up your sightseeing by early afternoon on the 23rd (Tue) to allow enough time to drive back home.